The physician can best appreciate the events of the cardiac cycle by measuring the pressures at various locations in the cardiovascular system with a catheter. Cardiac catheterization has become a powerful tool for the diagnosis of cardiac disease and the student must, therefore, become thoroughly familiar with the pressure profiles in the atria, ventricles, and great vessels. Formally, seven distinct phases during a single cardiac cycle are recognized. Figure 3 illustrates how aortic pressure, left ventricular pressure, left atrial pressure, left ventricular volume, and the ECG are temporally correlated throughout these seven phases. Period A in Fig. 3 represents atrial systole. Note that contraction of the left atrium causes both the left ventricular and left atrial pressure to rise by a few mm Hg. This rise in the atrial pressure is called the A wave. As the atrium begins to relax atrial pressure falls causing the X wave. The volume of blood present in the ventricle at the end of atrial systole is termed the end-diastolic volume. In period B, the isovolumetric period of contraction, ventricular pressure is seen to separate from atrial pressure because of closure of the mitral valve. The upward movement of the mitral valve into the atrium causes the C wave. This is followed by a second fall in atrial pressure, the X wave. 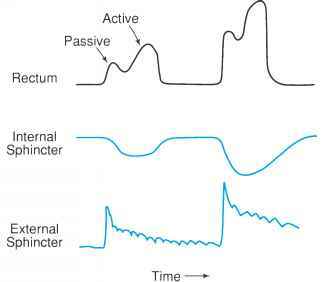 The isovolumetric period ends as left ventricular pressure reaches arterial pressure and the aortic valve opens. During period C, most of the stroke volume is ejected into the aorta, as shown by the volume trace; hence the term rapid ejection phase. The next phase, D, is termed the reduced ejection period. During both ejection periods, the aortic valve is open, making the aorta and left ventricle a common chamber and the pressure within them nearly equal. Therefore, the atrial pressure appears to closely follow the ventricular pressure trace throughout the two ejection periods.